The British were notorious for arguing for low RDI's. This is because UK struggled to feed itself, in WWII they almost lost the war because they couldn't ship in enough food to feed the population. With the unlocking of magnetic mines, which my Grandfather worked on, and better convoy's to beat the submarines they just scrapped through. Apparently they set their adult RDI at 100 IU of vitamin D a day. This is because seven adult women who had abnormal bone softening which is called osteomalacia in adults or rickets in children. 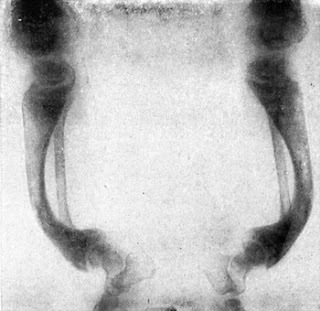 A x-ray of a child with rickets is shown below. At the top of the picture is the end of the thigh and the knee joint. Then comes the shine bones connecting to the ankle and heal. The shin bones should be straight, yet they are curved at an appalling angle! So back to the seven women with this type of bone problem - When they were feed 100 IU of vitamin D who were cured of the bone softening with this dose. However the accepted RDI became 400 IU. This was due to 400 IU being the approximate amount of vitamin D in a teaspoon of cod liver oil. Cod liver oil used to be feed to children and adults at one teaspoon to keep them healthy. Children and parents on this dose didn't have rickets or osteomalacia so clearly this was an adequate dose. However in 1997 the RDI yet again changed to 200 IU. This was due to adoption of American standard as an international standard. The 200 IU was described as "a generous allowance"
All of these figures were determined before it was possible to measure the concentration of vitamin D in the blood stream! Now we can...... and I will cover this tomorrow and hopefully it will wrap up this very long series on vitamin D.